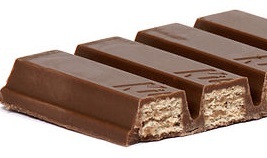 What do you feel like when you buy a Kit-Kat, take a bite and discover there is no wafer? Do you scream and shout about the deviance of said chocolate bar? Do you throw it to the floor in disgust? Do you write to Nestle demanding they send you the missing wafer? No? But why don’t you do that? – after all you bought the blinking thing in the first place because it has a wafer, surely? You actively desired the wafer! Otherwise you’d have plumped for a Cadbury’s Dairy Milk or maybe selected a Yorkie (only if you’re a boy, of course). But no, you have a little smile to yourself, you enjoy the extra chocolate, and some of you might even feel the need to post on Facebook. “Just had a KitKat with no wafer – RESULT!” By the way, if this is you, please do not do this. I am happy for you really, but you’re cluttering up my feed. So why is it that we feel just a little bit blessed when we encounter the Kit-Kat with no wafer? I guess it’s because we can enjoy quite a relaxed state of mind around snacks and can see the experience as serendipity. Sure, maybe we wanted the wafer, but actually the sweet surprise of solid chocolate makes up for all that. So what if we took this reaction and applied it to the rest of our lives? To relationships and business? Can you imagine how happy you’d be if when things didn’t go according to plan you were even happier with the results? It’s all about attitude, and having an open mind and not focussing so intently on getting things precisely as we want them when certain factors are outside of our control. You must be prepared to look for opportunities in adversity and to look upon the most favourable aspects of what might otherwise be deemed a negative experience to achieve serendipity more often. This attitude gives us the freedom to commit to undertakings without being blind to all the other opportunities that might come our way. And it gives us the valuable skill of always finding the positives in life. overcome the struggles on this chakra. thhat it’s really informative. Iam gonna watch out for brussels. I just want to tell you that I am just beginner to weblog and absolutely liked this web blog. Almost certainly I’m going to bookmark your site . You actually come with wonderful articles and reviews. Thanks a bunch for sharing your webpage. I almost feel that now I can post one saying my Kit Kat has the wafer in its correct position, as advertised . Great goods from you, man. I’ve understand your stuff previous to and you’re just extremely wonderful. I really like what you have acquired here, certainly like what you are saying and the way in which you say it. You make it entertaining and you still care for to keep it wise. I can’t wait to read far more from you. This is really a terrific website. I have recently started a blog, the info you provide on this web site has helped me tremendously. Thanks for all of your time & work. “Patriotism is often an arbitrary veneration of real estate above principles.” by George Jean Nathan. Useful information. Lucky me I found your web site by chance, and I’m stunned why this twist of fate did not came about earlier! I bookmarked it. I just want to mention I’m beginner to blogging and site-building and actually loved you’re page. More than likely I’m going to bookmark your blog . You amazingly have beneficial articles and reviews. With thanks for sharing with us your web-site. Great post. I was checking constantly this blog and I’m impressed! Extremely useful information particularly the last part 🙂 I care for such info much. I was looking for this particular info for a very long time. Thank you and good luck. excellent post nilpskia, very informative. I wonder why the other specialists of this sector do not notice this. You must continue your writing. I’m sure, you have a great readers’ base already! I simply wanted to jot down a comment so as to say thanks to you for all the marvelous pointers you are sharing on this website. My time intensive internet lookup has at the end of the day been recognized with awesome knowledge to go over with my contacts. I ‘d mention that we visitors actually are undoubtedly endowed to exist in a wonderful site with many brilliant individuals with interesting strategies. I feel somewhat blessed to have come across the weblog and look forward to plenty of more pleasurable times reading here. Thanks once again for a lot of things. I needed to write you one little bit of word in order to thank you over again on your pleasant suggestions you’ve shown in this article. It’s certainly strangely open-handed of people like you giving easily what a lot of folks would’ve sold for an electronic book to get some bucks for themselves, chiefly given that you could possibly have tried it in the event you decided. The tricks additionally worked like a good way to be aware that someone else have similar dream the same as my own to know the truth way more regarding this condition. I believe there are thousands of more fun periods up front for people who start reading your blog. Heya i am for the first time here kominertik. I came across this board and I find It truly useful & it helped me out much. I hope to give something back and aid others like you helped me. hello!,I like your writing so a lot! share we communicate extra about your post on AOL? I need a specialist in this space to unravel my problem. Maybe that’s you! Looking ahead to look you. Thank you a lot for giving everyone a very memorable opportunity to check tips from this web site. It really is very pleasing plus stuffed with amusement for me personally and my office mates to visit your website really thrice in 7 days to learn the fresh things you will have. And indeed, I am also usually amazed with your special advice you give. Selected two points in this posting are essentially the very best we have ever had. I actually wanted to develop a small note to be able to thank you for these marvelous guidelines you are showing on this website. My considerable internet search has finally been paid with reasonable know-how to exchange with my visitors. I would point out that we site visitors actually are undoubtedly endowed to be in a decent place with so many perfect individuals with valuable points. I feel rather privileged to have discovered your webpages and look forward to tons of more fun times reading here. Thanks a lot once again for everything. I would like to thank you for the efforts you have put in writing this blog. I’m hoping the same high-grade web site post from you in the upcoming as well. Actually your creative writing skills has encouraged me to get my own blog now. Actually the blogging is spreading its wings quickly. Your write up is a good example of it. I wanted to send you a little note to help thank you so much as before for those beautiful things you have provided on this site. This is really shockingly generous of people like you giving unhampered what most of us could possibly have distributed for an ebook to help make some dough for themselves, most importantly given that you might have tried it if you wanted. The tips as well served as a good way to be aware that someone else have a similar interest the same as mine to figure out more in terms of this matter. I am sure there are numerous more fun moments in the future for many who read through your blog post. I must point out my love for your kindness giving support to those people that absolutely need help with in this concern. Your personal dedication to getting the solution all-around came to be wonderfully good and has in most cases made men and women just like me to achieve their ambitions. The warm and friendly guideline implies a lot a person like me and much more to my office colleagues. Many thanks; from everyone of us. I must vipmeker voice my love for your kind-heartedness in support of people that require guidance on this one content. Your special dedication to getting the solution throughout turned out to be exceedingly insightful and have all the time made professionals like me to achieve their goals. Your personal important guide indicates a great deal a person like me and a whole lot more to my office colleagues. Thanks a ton; from all of us. Wonderful goods from you, man. I’ve understand your stuff previous to and you are just too magnificent. I really like what you have acquired here, really like what you’re saying and the way in which you say it. You make it enjoyable and you still care for to keep it wise. I cant wait to read far more from you. This is actually a terrific site. Very well written story. It will be valuable to everyone who employess it, as well as yours truly :). Keep up the good work – for sure i will check out more posts. I do accept as true with all the concepts you’ve presented in your post. They are really convincing and can certainly work. Still, the posts are too brief for beginners. Could you please prolong them a little from subsequent time? Thanks for the post. I and also my friends came viewing the good tips from your web site then before long I had an awful feeling I had not thanked the site owner for those techniques. Most of the ladies came consequently joyful to see all of them and now have in fact been taking advantage of these things. We appreciate you indeed being well helpful and then for settling on this kind of magnificent useful guides millions of individuals are really desperate to understand about. My honest regret for not saying thanks to you earlier. I want to show appreciation to this writer just for bailing me out of this condition. As a result of looking out through the search engines and getting methods which are not beneficial, I assumed my entire life was gone. Being alive minus the answers to the issues you have solved through the article content is a serious case, as well as the ones that might have adversely affected my career if I hadn’t encountered your web page. That skills and kindness in dealing with all things was crucial. I don’t know what I would’ve done if I hadn’t come across such a step like this. I can at this time look ahead to my future. Thanks for your time very much for this professional and result oriented guide. I will not be reluctant to refer the blog to any individual who would like recommendations on this matter. Just wish to say your article is as astonishing. The clarity in your post is simply cool and i could assume you’re an expert on this subject. Well with your permission allow me to grab your RSS feed to keep up to date with forthcoming post. Thanks a million and please carry on the gratifying work. I have been exploring for a little for any high-quality articles or blog posts on this sort of space . Exploring in Yahoo I ultimately stumbled upon this site. Reading this info So i am satisfied to exhibit that I’ve a very excellent uncanny feeling I discovered just what I needed. I such a lot definitely will make certain to do not forget this website and give it a look on a relentless basis. Just want to say your article is as amazing. The clearness in your post is simply spectacular and i could assume you’re an expert on this subject. Fine with your permission allow me to grab your RSS feed to keep updated with forthcoming post. Thanks a million and please keep up the rewarding work. Thank you for sharing excellent informations. Your web-site is so cool. I am impressed by the details that you¡¦ve on this website. It reveals how nicely you perceive this subject. Bookmarked this web page, will come back for extra articles. You, my friend, ROCK! I found just the info I already searched everywhere and just could not come across. What an ideal site. Thank you for sharing superb informations. Your web site is so cool. I’m impressed by the details that you¡¦ve on this website. It reveals how nicely you understand this subject. Bookmarked this website page, will come back for more articles. You, my friend, ROCK! I found just the information I already searched all over the place and just could not come across. What an ideal web site. I do believe all the ideas you have presented on your post. They’re very convincing and can certainly work. Nonetheless, the posts are too quick for novices. May just you please lengthen them a little from next time? Thank you for the post. Thank you a bunch for sharing this with all people you really understand what you are speaking about! Bookmarked. Kindly also talk over with my site =). We will have a link change agreement between us! I would like to convey my passion for your kind-heartedness giving support to folks who have the need for help with the concern. Your very own dedication to getting the message across had been really functional and have really helped associates much like me to arrive at their dreams. Your entire useful help means a great deal to me and even further to my office workers. With thanks; from everyone of us. Howdy! I simply would like to give binerfiude an enormous thumbs up for the good information you could have here on this post. I will probably be coming again to your blog for extra soon. I believe this internet site has some rattling great information for everyone : D.
Great goods from you, man. I’ve understand your stuff previous to and you are just too excellent. I actually like what you’ve acquired here, certainly like what you are saying and the way in which you say it. You make it entertaining and you still take care of to keep it wise. I can not wait to read far more from you. This is actually a terrific website. My searches seem full.. thank you. Extremely handy viewpoint, thanks for writing.. Actually valuable perception, thank you for blogging.. Good thought processes you have got here..
Hiya! Fantastic weblog! I happen to be a day-to-day visitor to your internet site (somewhat far more like addict ) of this web site. Just wanted to say I appreciate your blogs and am seeking forward for more! I’m commenting to make you know of the beneficial encounter my friend’s child gained checking your webblog. She even learned a good number of things, including how it is like to possess a great coaching heart to let many others completely know precisely a number of hard to do issues. You actually did more than our own expected results. Thank you for supplying those practical, trustworthy, revealing as well as fun tips on that topic to Sandra. Thanks a lot for sharing this with all people you actually recognise what you’re talking about! Bookmarked. Please also seek advice from my web site =). We may have a hyperlink trade contract among us! hi!,I like your writing so a lot! share we communicate more about your post on AOL? I require an expert in this area to solve my problem. Maybe that’s you! Having a look forward to peer you. Helpful information. Lucky me I discovered your web site unintentionally, and I am stunned why this twist of fate didn’t took place earlier! I bookmarked it. Howdy very nice website!! Man .. Beautiful .. Wonderful .. I will bookmark your site and take the feeds additionally¡KI am happy to search out a lot of helpful info here in the post, we need develop extra strategies in this regard, thanks for sharing. . . . . . I actually wanted to jot down a quick word so as to say thanks to you for all the pleasant tips and hints you are sharing on this site. My time intensive internet lookup has finally been rewarded with sensible knowledge to exchange with my visitors. I would mention that we readers are undeniably endowed to dwell in a wonderful place with very many perfect professionals with very helpful tips. I feel very happy to have come across the website page and look forward to some more enjoyable times reading here. Thanks once again for everything. What i do not understood is actually how you’re now not really a lot more well-liked than you may be now. You’re very intelligent. You recognize thus considerably in the case of this topic, produced me in my view consider it from numerous various angles. Its like men and women aren’t interested except it¡¦s one thing to do with Lady gaga! Your own stuffs nice. All the time take care of it up! It is really a nice and useful piece of information. I¡¦m satisfied that you just shared this useful info with us. Please stay us informed like this. Thanks for sharing. Magnificent site. Plenty of helpful info here. I am sending it to some friends ans also sharing in delicious. And naturally, thank you for your effort! hi!,I like your writing so a lot! percentage we communicate extra about your post on AOL? I require a specialist in this area to unravel my problem. May be that’s you! Looking forward to look you. I simply want to say I’m beginner to blogs and actually savored you’re blog. Probably I’m want to bookmark your blog . You really have beneficial writings. Thanks a bunch for revealing your web page. I was just looking for this information for a while. After six hours of continuous Googleing, at last I got it in your website. I wonder what is the lack of Google strategy that do not rank this kind of informative websites in top of the list. Generally the top sites are full of garbage. I wish to convey my appreciation for your kind-heartedness for all those that really need help on this important theme. Your very own commitment to passing the message throughout appears to be unbelievably advantageous and has regularly helped workers just like me to achieve their dreams. Your entire interesting publication can mean much to me and far more to my office colleagues. Thanks a lot; from everyone of us. Hello there, You have done a great job. I will definitely digg it and personally recommend to my friends. I’m confident they will be benefited from this website. I have been browsing on-line greater than 3 hours these days, but I by no means discovered any attention-grabbing article like yours. It¡¦s pretty price sufficient for me. In my opinion, if all webmasters and bloggers made just right content material as you did, the net shall be a lot more useful than ever before. Wow, superb weblog format! How long have you ever been blogging for? you made running a blog look easy. The whole look of your web site is magnificent, as well as the content material! I simply wanted to appreciate you all over again. I am not sure what I might have done without the type of basics contributed by you on that situation. It previously was an absolute traumatic crisis in my position, but being able to view the well-written manner you treated the issue made me to cry with delight. I am happy for this advice and then hope that you realize what a great job that you’re undertaking training men and women all through your webblog. Probably you haven’t got to know all of us. « Is Your Fitness Focus All Wrong?